Explanation: Good cameras were able to obtain impressive photographs of Comet Hale-Bopp when at its brightest earlier this year. 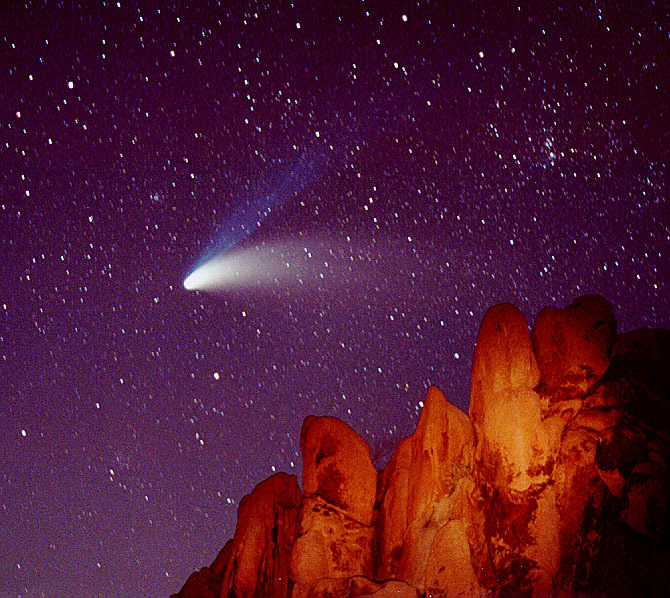 In the above photograph taken April 5th, Comet Hale-Bopp was imaged from the Indian Cove Campground in the Joshua Tree National Forest in California, USA. A flashlight was used to momentarily illuminate foreground rocks in this 30 second exposure. Comet Hale-Bopp is still visible to the unaided eye in Earth's Southern Hemisphere, with observers there reporting it to be about 4th magnitude. The comet is now passing nearly in front of the star Sirius, and shows only a slight dust tail.